Fifteen electric buses will soon be running on Alexandria’s streets. The new vehicles use chemical energy stored in rechargeable battery packs. They are less costly in maintenance and more environment-friendly. Tickets will range from LE5 to LE10 according to the destination. Eleiwa said the target was to make Alexandria a green city by 2030. The idea of turning from traditional buses using solar and diesel to electric buses started in 2015. “The cost of annual maintenance and repair of the regular buses reaches LE200,000 compared to only LE50,000 for electric vehicles,” Eleiwa said. The new buses are made by a Chinese company and cost LE4 million each. “Pollution is very high in Alexandria because of the different types of emissions coming out of traditional cars. These emissions are poisonous and cause cancer. Protecting citizen’s health is one of the main reasons for using electric buses in public transportation,” Eleiwa said. The number of daily passengers that use public transportation in Alexandria is almost 800,000. 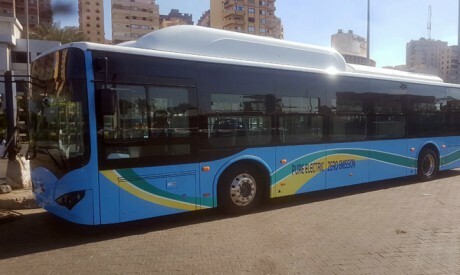 The plan to shift to electric buses was thoroughly discussed during the sessions of a conference held in Cairo under the name of Sustainable Transport in Egypt (STE 2018), Cleaner Mobility and the advent of Electric Vehicles. The event was co-organised by Friedrich Ebert Stiftung (FES), a German foundation that promotes social democracy, the Ministry of Environment and the Centre for Environment and Development for the Arab region and Europe (CEDARE). Richard Probst, FES resident representative, told the Weekly that FES and the Ministry of Environment held the event as the first international conference on electromobility (e-mobility) in Egypt. E-mobility is a general term for the shifting to electric-powered vehicles instead of those using fossil fuels. “We think that e-mobility and electric vehicles, especially in public transportation, can be a cure to Egypt’s pollution problem as it is a very good way for reducing CO2 emissions in the future,” Probst said. It is very important to focus on e-mobility as an integrated model where all kinds of transportation should be electric, according to Probst. “We were discussing even including electric tuk tuks,” he said. The capacity of an e-bus is 90 passengers while cars normally take from one to five passengers. This means that one bus can replace dozens of cars and thus help reduce traffic and pollution at the same time, Eleiwa said. Ahmed Al-Dorghami, representing CEDARE, told the conference of the importance of partnership between the private and public sectors to draw up public strategies. “There are cities like London, Berlin and New Delhi that now have low-emission zones and are on their way to halting the production of traditional cars and other vehicles using diesel,” Al-Dorghami said. Hani Mounib, a professor at Helwan University, believes that moving to e-mobility is a step that started very late in Egypt. Although the investment to move from traditional vehicles to e-vehicles is very high, Mounib said, it will save billions that are spent by the Ministry of Health for treating patients suffering from cancer due to pollution. Addressing the transport sector’s rising fuel costs and polluting emissions is a priority among planners and policy-makers in Egypt, especially in light of the fiscal burden of fuel subsidies. Mounib said that while LE110 billion were allocated to subsidise petroleum products in 2017, the bulk of this was directed to imported diesel fuel. With 9.3 million vehicles in Egypt, there is an urgency for planning an alternative, which is electric mobility as confirmed by various studies. Car assembly and production in Egypt’s vocational education curricula are currently void of studies on electric vehicles. Mounib also sees other benefits of e-mobility: it does not need much training and the production of such vehicles can offer job opportunities to thousands of technical education graduates each year.